Looking for solid hardwood, custom-made Elkhart Amish Furniture? Simply head on over to Weaver Furniture Sales in beautiful Shipshewana, Indiana. Take US-20 East for 20 miles. Turn RIGHT onto IN-5. Then proceed South for 1/4 mile. Then, turn LEFT onto country road 075 North. Proceed Northeast for 1/8 mile. Weaver Furniture Sales will be on the RIGHT. When it comes to solid hardwood, custom-built Amish furniture, no supplier compares to Weaver Furniture Sales in Shipshewana, Indiana. Because we carry about 5,000 items. And you can shop for sets or individual pieces. 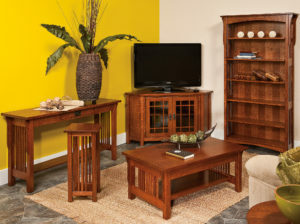 In fact, our lineup includes furniture for every room in your home. Including your bedroom and bathroom. Plus your living room, den and game room. We also have furniture for the kitchen, pantry and home office. In addition, you can choose your favorite style. Like Mission, Shaker or Modern. Also, you can shop for outdoor furniture. The best cabinetmakers in the Midwest are Amish men. And these artisans — from shops in Indiana and Ohio — skillfully handcraft our furniture. Also, the Amish builders use solid hardwoods. Like oak, maple, cherry and hickory. No wonder the furniture is so sturdy, durable — and beautiful! So browse our online catalog. And buy from home. Or, experience the furniture for yourself by visiting our ‘brick and mortar’ store in nearby Shipshewana. Get ready to tour our 25,000 square foot showroom. Have questions? Our friendly, knowledgeable sales staff will help. Also, you can take your purchase with you, or we’ll ship. Financing available. Browse our Amish Furniture, and we hope that you pay us a visit from Goshen or Elkhart, Indiana. Bring this special offer information with you to save!